In this lesson, I will give you important tips, tricks and advice for the IELTS writing task 1. The number of words is very important. You must write at least 150 words for the IELTS writing task 1. That means you must write more than 150 words. There is no maximum number of words. If you write fewer than 150 words, you will lose marks. My advice is try to write between 175 and 190 words. Do not copy long phrases from the question. 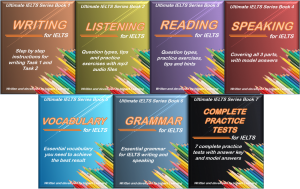 – The IELTS examiner will exclude those words from your word count. Learn to paraphrase the question into your answer in the introduction. “paraphrase” means to write something again using different words. The table below summarises some data collected by a DVD shop for the month of September 2016. Write a report describing the sales figures of various types of films, based on the information shown in the table. Comment: Answer 1 is a good answer because the student has used paraphrasing to reiterate the question using his own words. The answer is concise, coherent and introduces some new vocabulary that is relevant. Answer 2 is a bad answer because the student has just copied a long sentence, word for word, from the question. The examiner will just ignore that sentence and the student risks not writing enough words in his answer. It is very important to use the appropriate verb tense for the question. This means that your choice of tense must be correct. It is irrelevant if the form of your sentence is correct if you do not choose the correct tense. A good tip is to look for dates in the question and on the charts and tables. If the date is in the past, use past tenses. If the date is in the future, use future tenses. If there are no dates, use present tenses. Answer 1: Male customers bought 392 action movie DVDs during September 2016, compared to only 143 for females. Answer 2: Male customers buy 392 action movie DVDs during September 2016, compared to only 143 for females. Comment: Look for dates and times is the question. We can see that the data is from September 2016 which is in the past. Therefore your answer must use the past tense, NOT the present tense. 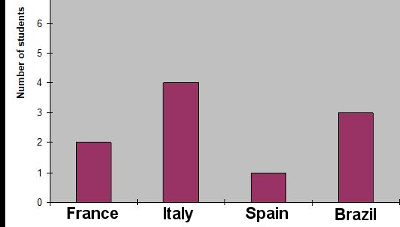 The bar chart below shows the number of foreign students studying medicine at Bristol University. Write a report describing the information shown. Answer 1: Students from 3 European countries are studying medicine at Bristol University. Answer 2: Students from 3 European countries studied medicine at Bristol University. Answer 3: Students from 3 European countries will study medicine at Bristol University. Comment: Answer 1 above is correct. There are no dates or times in the question. Therefore, you should use the present tense in your answer. Any other tense is wrong. In writing task 1, you are being asked to describe the data, the process or the chart. That is all. Nothing else. You are not being asked for your opinion about the data. You are not being asked to explain the data. You are not being asked to describe anything related to the topic. Stick to the facts. You are being asked to objectively describe the data. If the data is about a subject that you know very well, do NOT be tempted to write about it. The IELTS examiner doesn’t care! It is irrelevant. This is not an economics or science test. Describe the data without analysis, opinion or any other explanations. The table below shows the number of foreign students studying medicine at Bristol University. Write a report describing the information shown. Answer 1: The majority of foreign students studying medicine at Bristol University come from Japan. Answer 2: The majority of foreign students studying medicine at Bristol University come from Japan. This is because there is a student exchange program between Bristol and Tokyo. Comment: Answer 1 above is a good answer. Answer 2 is a bad answer. The text in blue above is irrelevant. Even if it is correct that there is an exchange program between the 2 countries, that is not the question. You are not being asked WHY. Read the question. You only need to describe the data.